With a loss in the Rose Bowl, Florida State’s two-season-long winning streak is now at an end. Ironically, the ‘Noles won’t make a return visit to the national championship game because they didn’t do what they’ve done in each of the last two seasons – make the most of their opportunities. That’s what made the difference in this contest. Sure, turning the ball over five times didn’t help, but Florida State has had no trouble overcoming these issues in the last two years. In fact, the Seminoles went 5-0 this season when losing the turnover battle, including two victories in which they finished minus-2. How were they able to pull this off? Simple: FSU capitalized on the opportunities in front of them. Whenever they came up with a stop or forced a turnover, they turned it into points. Unfortunately for those that bleed Garnet and Gold, that didn’t happen on New Year’s Day. After Florida State’s defense stopped Oregon on downs early in the game, the ‘Noles didn’t get into the end zone, as Jameis Winston’s knee touched the ground just short of the goal line on the first play of the second quarter. At the end of the first half, FSU failed to convert a Marcus Mariota interception into points, with Robert Aguayo’s 54-yard attempt hitting the upright. The biggest missed opportunity came on the opening drive of the second half. With the Seminoles’ offense in position to take the lead, Oregon’s Derrick Malone forced and recovered a Dalvin Cook fumble. This timely strip took the wind out Florida State’s sails, and essentially ended the contest. Looking at the last two paragraphs, it’s important to give the Ducks all of the credit for making these things happen. As everyone else who’s played them over the past two seasons will attest to, the Seminoles always seem to make the most of every opportunity. 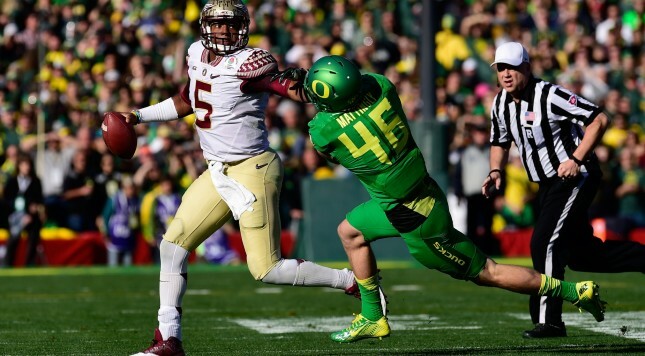 The fact that Oregon was able to keep a clutch player like Jameis Winston out of the end zone on fourth down; stiffen up just enough to prevent one of college football’s most accurate kickers to miss; and force a fumble against a team that had lost only eight all season, speaks volumes about how good a team the Ducks are. There’s simply nothing lucky about it. Congratulations, Oregon – you’ve proved on the gridiron that you belong in the College Football Playoff National Championship Game.